R-15 rigid foam wall insulation is stable, durable & waterproof. Insulated basement windows feature maintenance-free vinyl frames and low-e glass. Moisture-proof flooring tile system with interlocking installation eliminates the need for mortar and adhesives. Remodeling your basement with the Total Basement Finishing (TBF) system is super GREEN! You’ll be gaining extra living space without building an addition that takes up valuable yard space and requires more lumber and energy-intensive building materials (concrete, asphalt shingles, etc.). Our finishing process will make your basement more comfortable and improve your home’s overall energy efficiency. The materials we use contain recycled content and no hazardous formaldehyde. Our finishing products won’t be damaged by moisture or attract mold. In fact, they easily outlast “off-the-shelf” products that must be replaced when damaged by moisture, mold & hard use. Longevity is another green feature! DBS is a certified installer of the Total Basement Finishing system - green products that will last you a lifetime. 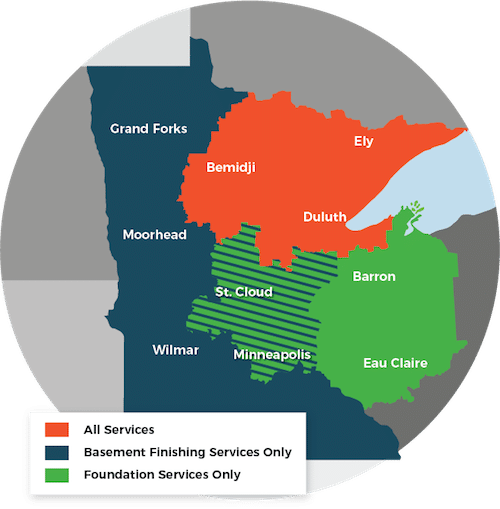 We offer free quotes throughout the Minnesota and Wisconsin area, including Grand Rapids, Eveleth, Hibbing, Proctor, Hayward, Bemidji, Eau Claire and many areas nearby. Call or e-mail us today to get started! Products like drywall, fiberglass and wood studs become damp and attract mold, therefore the air you breathe will contain microscopic mold spores that can cause a wide range of serious health problems. Tearing out basement materials damaged by mold & moisture adds to the volume of waste we deposit in landfills – another important environmental issue. The TBF system avoids these problems, which impact health, environmental quality and your finances. That’s why we’re your greenest basement finishing option. Do it once, do it right and do it green with Total Basement Finishing. Total Basement Finishing is a "Green" choice! To get started with a free estimate, call us or send them an e-mail today! We proudly serve Duluth, Superior, Minneapolis and surrounding areas of Minnesota and Wisconsin. Why Pick A Basement Expert?